The drama continues to show a fantastic look at the lives of military families with equal doses of humor and emotion that makes it a great journey to march to. 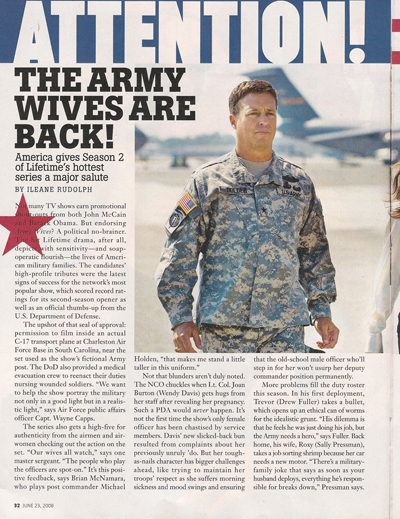 Since its debut in 2007, Army Wives has become Lifetime’s highest rated drama ever and it’s not hard to see why. 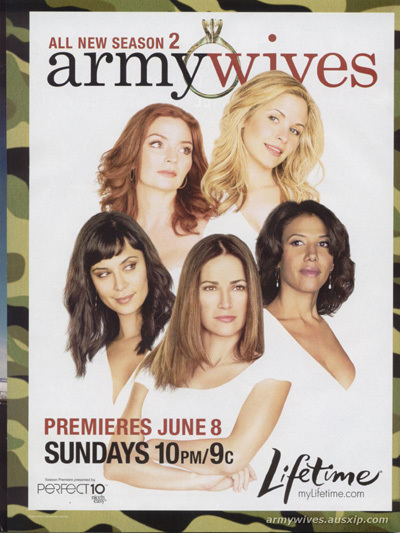 The excellent cast (headed by Emmy-winner Kim Delaney with Catherine Bell and Brigid Brannagh) is aided by very well written stories that show a nice look into the lives of military personnel and their families with a good mix of melodrama. Its third season continues that, adding new dramas with a mix of light humor at times, that helps create one of the more underrated dramas on TV today. Far from being just a “chick show,” it’s a great series and its third season shows why. As the season begins, the ladies of Fort Marshall are having some issues. Roxy (Sally Pressman) is facing a threat to take away the Hump Bar while Claudia Joy (Kim Delaney) and Michael Holden (Brian McNamara) have to put their move to Brussels off after their daughter Emmalin (Katelyn Pippy) runs off with her enlisted boyfriend. Denise (Catherine Bell) has to handle the fallout when her affair with a patient is discovered while her husband Frank (Terry Serpico) is in Iraq. Pamela (Brigid Brannagh) handles her husband going missing on assignment while Joan (Wendy Davis) takes on an arrogant rival Colonel as Roland (Sterling K. Brown) deals with helping raise their child. Things get rough for the ladies as Denise handles the coldness her friends give her over her affair as Frank wants a divorce. Just as she gets the bar back, Roxy learns she owes several thousand dollars in back taxes, forcing her to make changes, including an eccentric partner (Tonya Perkins). Meanwhile, her husband Trevor (Drew Fuller) has become addicted to painkillers over his injury last season which causes conflict with his family and job. Joan has to prove she deserves her promotion while her rival begins pulling some shady moves to take her down. Roland begins to work with a youth counselor with a shady secret that could hurt things. Claudia Joy decides to stay in the area with Emmalin and keep up being the head woman on the base. Things get more dramatic mid-season when Denise and Claudia Joy are in a car accident and in the aftermath, Claudia Joy discovers a serious medical condition. Pamela is worried when Chase (Jeremy Davidson) returns boasting some signs of torture which he refuses to discuss. Another complication is when Denise and Frank’s son Jeremy (Richard Bryant) loses a friend in Iraq and carries the guilt home with him. As always, the strength of the show is that it doesn’t politicize things. We do get stuff that may sound “rah-rah” for the army but the show can also criticize the military for things like failing to provide properly for families and some of their harder-hearted policies about conduct of their soldiers. We do still get the sense of pride that these people have of being in the army, that they truly believe in what they do and carry it out with as much dedication as they can. There are some bad apples (like the colonel willing to break some rules to put himself over Joan) but for the most part, these soldiers do respect their choice of work. The show does a good job at giving you a look at what military life can be and how the families deal with it. A twist later in the season shows even the military isn’t immune to the economic crunch as the base is threatened with being closed down for budget issues. That realistic touch of showing both sides and not mixing in too much political agenda helps the show be relatable to the viewer and enhances the drama. The show has lots of drama, especially with Denise’s problems and Claudia Joy’s medical issues. But the show also mixes in some comedy here and there such as when the ladies take part in a golf tournament and Roxie drives Denise crazy by being the worst player to ever pick up a set of clubs and doesn’t even realize how horrible she is. Another fun episode has Gilmore Girls’ Kelly Bishop as the widow of a politician who surprises Denise and Claudia Joy by going wild on the base, encouraging them to have some fun with their own lives. 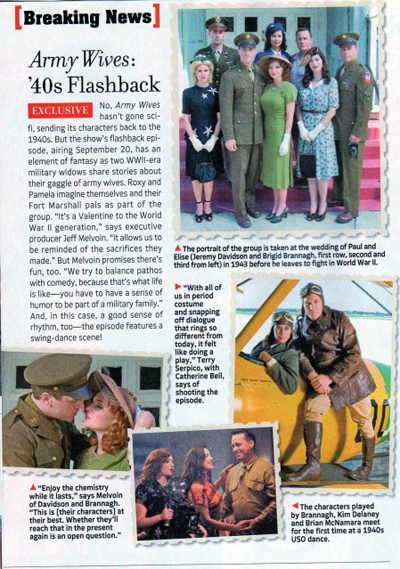 A unique episode has Roxie and Pamela talking to a couple of old ladies about their lives on the base in WWII and the cast gets to play dual roles in the flashbacks with nice bits like Roxie as an upper-class Manhattan woman while Frank is a non-army guy running a bar. Yet another has country star Shelby Lynne as a former country singer hitting hard times who Roxie tries to help at the bar. There are also good arcs like how Emmalin acts so put upon by her parents but when they take in a Muslim girl who lost her family, the teenager realizes how well she has it. The actors are the key to the show’s success. Delaney carries herself wonderfully throughout the season from her battles with her daughter to her own medical problems, trying to be strong through it all. She and McNamara are a believable married couple handling the pressures of their positions while also wrestling with the military life. Bell and Serpico are also good handling their possible separation and Bell and Delaney are great showing the tension of Bell’s betrayal and how it affects their friendship, Bell really getting to the emotional core of Denise and how she’s trying to hold on to the new life she carved for herself without totally giving up the old. Pressman is usually the lighter one of the bunch as Roxie with her wild attitude but does show the problems of running the bar and her family life as Trevor falls in some depression. Fuller gets a meaty arc as Trevor sinks into some drug addiction which affects his performance. Before that gets too far, though, he’s shifted to becoming a recruiting officer, trying to help a young woman get in the Army and it really blossoms him more as a character. Brannagh does get a bit too much out of the harried mom but the mystery involving her husband’s secrets leads to some big dramatic bits as the season goes along. Davis and Brown are also good as their marriage has evolved well (a great bit is where Roland lets the girls understand Denise by revealing his own affair back in Season 1 and how he and Joan overcame it) with Joan handling her command and motherhood, Roland trying to help people in need and the tension when she’s recalled to Iraq. Meanwhile, Davidson really comes into his own this season, first reacting to his parents’ possible divorce and then racked with guilt after the death of a friend, which sets up the stunning finale cliffhanger. Overall, the series has ups and down in tone as we get some comedy followed by powerful drama but as in its first two years, the realistic view of the military grounds all the action and allows you to understand this side of life in a reasonable way. But the sharp writing, good plotlines and best of all the wonderful acting, makes the show a great series to watch. Avoiding politics is a fantastic way to keep the stories from being overwhelmed and the season shows how the drama has loyalty at its heart which carries over to the viewer in a terrific fashion. Video: Widescreen 1.78:1, enhanced for 16X9 sets. As usual, ABC Studios does a great job with a crisp image, the Southern setting almost seeming to give the show a unique feel and the video does a great job showing that. Audio: Dolby Digital 5.1 Surround Sound with subtitles in French and English. The audio is mostly good, although a few times you may have to adjust the sound (particularly in some of the action sequences) but it’s still crisp throughout the production. The set is a nicely thin plastic snap case with all five discs set inside. No audio commentaries as on the previous season sets, which is a bit of a disappointment. Stationed in the South (21:46): This feature shows how the cast spends their time in Charleston, the producers shown on camera speaking of how wonderful the city is and how its history and culture add to the show. Bell is shown taking a boat around the harbors with Serpico, the two getting along pretty well. When Bell’s husband and daughter arrive, it’s revealed how she jokingly refers to him as “Husband number one” with how she and Serpico get along off-set and her daughter is a cute tyke. Brown was said to be somewhat shy before revealing he gets into basketball games, from pickup games to local schools and good with it. While both are married to others, Brannagh and McNamara spend time together as we see them visiting the city’s Market Pavilion and enjoying a nice dinner. Pressman spends time at a local yoga class while Fuller spends time with autistic children at the MUSC Children’s Hospital. Davis is shown teaching local acting classes as Delaney and Pippy take an old-fashioned carriage ride through the city. While some of these may feel staged, you get the reality of the cast loving the city and how it enhances the show and it’s a great look at an old town as well. There are fifteen deleted scenes, all on one disc. Most are clearly cut for time but some fun things like the ladies reacting to hearing about Roland’s affair and realizing how they might need to cut Denise a break and some stuff with Jeremy that enhances his storyline. 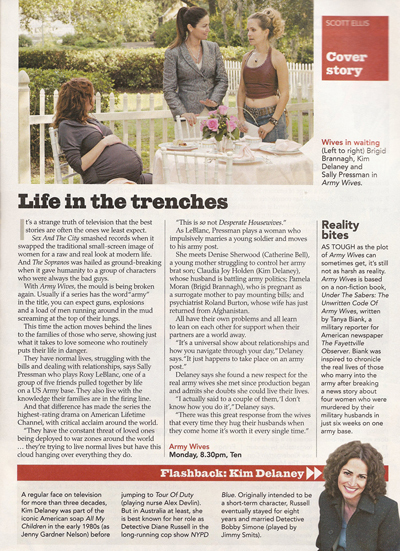 A pair of Webisode series that ran on Lifetime’s site along with the show are included, each running about two and a half minutes. 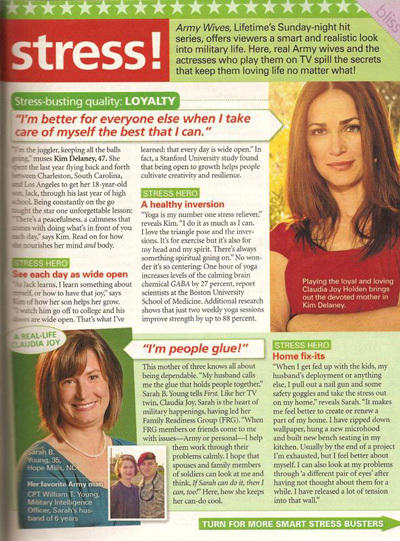 The first three focus on Joan and Roland from handling parenthood to a fight over her deciding to go back to Iraq without telling him. The latter three show Jeremy in Iraq, dealing with the news of his parents and the task ahead of him. They may seem filler but do help deepen the character arcs, especially Jeremy’s, making his storyline shine more. 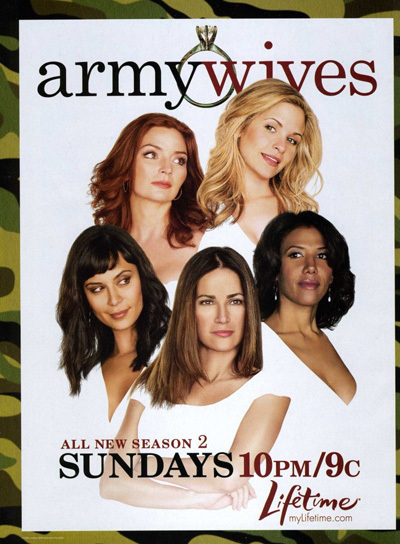 Army Wives Gives Back is a trio of two-minute features where Davis and Brown give real female Army officers some special gifts from a spa visit to a makeover, a nice way to pay tribute to the real-life figures that inspired the show. Finally, there’s a Blooper Reel (8:30) of various mishaps on set and nice seeing the gang enjoy themselves.